Precious metals futures ended mixed Monday as gold and silver gained and platinum and palladium declined. Gold finished at a seven-and-a-half-month high. Gold for February delivery added $5, or 0.4%, to end at $1,303.10 an ounce on the Comex division of the New York Mercantile Exchange. The settlement was the highest since June 14 when gold finished at $1,308.30 an ounce. "Technically, February gold futures bulls have the overall near-term technical advantage and have gained more power recently, keeping a price uptrend in place on the daily bar chart," Jim Wyckoff, a senior analyst at Kitco Metals Inc., said in a report. "Gold bulls’ next upside near-term price breakout objective is to produce a close above solid technical resistance at $1,330.00." 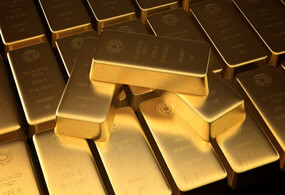 Gold futures ranged from a low of $1,296.50 to a high of $1,303.70. They picked up 1.2% last week. Silver for March delivery rose 6.6 cents, or 0.4%, to settle at $15.765 an ounce. The close was the strongest since Jan. 3 when silver settled at $15.797 an ounce. Silver futures traded between $15.61 and $15.83. They gained 2% last week. April platinum declined $3.80, or 0.5%, to $814.50 an ounce, ranging from $810.90 to $822.20. Palladium for March delivery fell $30.50, or 2.3%, to $1,289.30 an ounce, trading between $1,287.70 and $1,329. Last week, platinum moved up 2% and palladium lost 1.2%. Gold added $8.25, or 0.6%, to $1,302.15 an ounce. Silver rose 31 cents, or 2%, to $15.685 an ounce. In LBMA prices last week, silver and palladium declined by 0.6% and 3.2% while gold and platinum rose by 0.8% and 1.4%. United States Mint bullion sales climbed by a combined 1,000 ounces in American Gold Eagles, by 60,000 ounces in American Silver Eagles, and by 1,000 ounces in American Platinum Eagles.